While the Superfund Act [CERCLA] resulted from national awareness of Love Canal, and though Newman focuses on the success that legislation represents, we conclude with a troubling denouement. Love Canal is now Black Village Creek, filling up with a new round of working-class residents enticed by homes priced 10 – 20% below market value. Though former residents including Gibbs fought the relocation, they lost this battle. Developers won. The results have been tragic; as Newman recounts, health problems and toxic exposures have reemerged in this ‘remediated’ community, despite the extensive, state-of-­the-­art environmental engineering schemes used to filter leachate and otherwise remediate the site. Newman’s Love Canal succeeds in highlighting for readers an exceptionally timely notion: before the institutionalization of the U.S. Environmental Protection Agency’s Superfund Program, the American landscape was riddled with unregulated, unmonitored, and often unknown chemical and industrial dumps from America’s dizzying participation in the Industrial Revolution. 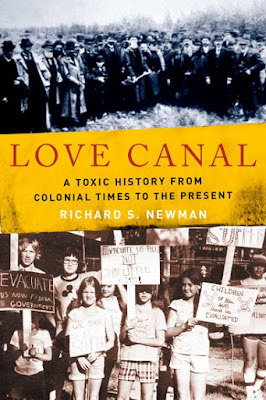 Communities like Love Canal that dealt with these historical mistakes, Newman shows, contended with rampant pollution, contested and rare health outcomes, and instances of deep disempowerment. Newman showcases for his readers the immense risks and voluminous unintended consequences that emerge when environmental regulations are absent and when the precautionary principle is eschewed in favor of industrial economic development, in one era after another. His historical details, and his careful examination of the numerous barriers faced by Love Canal activists, display that regulatory programs that protect public and environmental health are relatively new, have been hard won, and are constantly vulnerable to eradication. Indeed, these are the very programs that have most swiftly come under attack under the Trump Administration – which makes Newmans’s message so relevant and timely. [W]hile Newman makes a compelling case for the important historical role of the Superfund Act and the vital role Love Canal activists played in its legislative success, Newman’s book falls short in assessing the ways in which broader neoliberal ideologies about environmental regulation helped push back against Love Canal activism, even as it began. This was even more significant as the Love Canal area was remediated, resettled and reinvented and as new homes were marketed as inexpensive and safe in the re-­named Black Creek Village. While Newman discusses the new settlement in the Epilogue, he does not use his data to illuminate a key thread linking together the historical eras he has reviewed in earlier chapters: Each era’s growing concern with industrial, market-­based economic development. These pre-­occupations and policies only intensified in the neoliberalized years of Love Canal’s re-­branding and re-settlement, but these larger patterns are not adequately articulated or analyzed by Newman. Thus, Newman does not conclude with a strong sense of the how these patterns put American communities at risk in a political-­economic context where environmental regulations are demonized by U.S. politicians and, now, millions of Americans. Indeed, we do not get a strong sense of how historically at risk regulatory programs like the Superfund actually are. We get little sense of how difficult it is to engage in sustained EJ [environmental justice] activism. We have only abstract notions of how many communities contend with environmental disasters; how many of them face structural barriers so significant that they never reach their goals, never know the relocation experienced by... Love Canal residents. We do not fully explore, either, the deep symbolism of Love Canal’s re-­settlement, which illuminates brilliantly just how contentious and fleeting environmental and public health protections can be in a market-­dominated era where an inexpensive home or well-­paying job can entice people with little economic wealth to take environmental risks and create ‘sites of acceptance’ regarding industrialization’s EJ costs.